Aid relief doctor second man to be flown to Germany for treatment; 8,400 cases of Ebola worldwide thus far. A UN worker infected with Ebola has died in a Liepzig hospital Tuesday, after he traveled to Liberia to treat the disease as part of the organization's relief effort. The man, a 56 year-old doctor from Sudan, is the second person from the UN Mission In Liberia, or UNMIL, to have died of the disease. Another aid worker died on September 25. 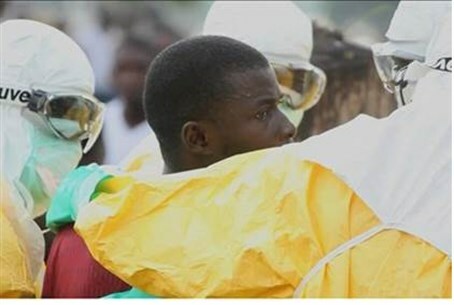 Meanwhile, 41 members of UNMIL have been placed in isolation over fears of an outbreak, Liberian news websites reported Tuesday. Tuesday's victim was flown late last week from Liberia to the St. Georg Clinic in Leipzig, 201 km (125 miles) southeast of Berlin - one of just seven healthcare facilities in Germany capable of treating patients in isolation. To prevent contamination, the man had arrived in Germany on a specially adapted Gulfstream jet with an isolation chamber, according to the Guardian, and had been treated both onboard and upon arrival by a special staff equipped with protective gear. Upon arrival, doctors had rated him as "highly critical, but stable," but he died just five days later. This is the second Ebola patient to have been flown to Germany to deal with the virus, according to the Telegraph; the first, a Senegalese man, was flown to Hamburg after being infected in Sierra Leone. He was treated successfully and released last week. Over 8,400 people have been infected with Ebola, according to latest WHO estimate published Tuesday - including several cases recorded in Spain and in Macedonia. At least 4,000 people have died in West Africa alone. Roughly 50% of people who contract Ebola die of it, with that rate skyrocketing to as much as 90% in underdeveloped countries.